It’s been a while since we’ve done a giveaway, so this one is going to be short and sweet. 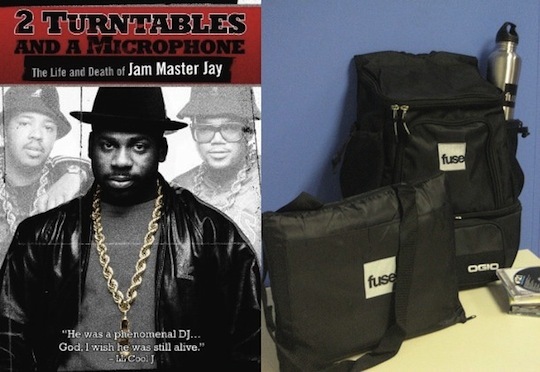 Up for grabs is a Fuse goody bag and a copy of the 2 Turntables And A Microphone DVD, which chronicles the life and death of Run DMC’s DJ Jam Master Jay. Leave a comment with the name of the DJ that influenced you the most. A comment will be chosen at random. A winner will be chosen on Thursday, July 29th at 3pm EST. Note: The contest is over and the winner has been notified. DJ Gee Supreme…learned how to spin and make beats watching him. Jazzy Jeff. The total package as a DJ! And his record selections is always perfect! Preemo – scratch sentences over hooks were huge. real hip hop!! shout out to cratekings !!!!!!! Damn….just one? F@ck! I like Roc Raida for his showmanship, I like Bambaata and the late DJ AM for versatility in playlists (there sets are unorthodox, yet so fluid). Man, how can I not look up to Jazzy Jeff…DJ Craze from Miami (nobody has done it like him at the DMC’s, my gosh…also DJ I-Dee, I think he is one that has the tightest chirp scratch). Really though, you really want me to pick one…really? Man, I’m going to say DJ Entice, my dude from Miami! He is the closest DJ I know personally thats doing big things right in front of me and he is by far one of the cleanest mixers/scratchers down here. If it wasn’t for him captivating me with what he does I wouldn’t have researched the others like I did. I’m a student of this thing. Also, let me throw A-Trak, Q-Bert, Z-Trip in the group up above. As for my final answer, its DJ Entice! the coldest of weather, but when you put them on in summer they won’t overheat your foot. Kid Capri is the only famous DJ that is good on the turntable and great on the mic. Second Though!! Jam Master Jay is the best of all time.